is a technology and culture writer whose work has appeared in The Atlantic, The Wall Street Journal, The New York Times, Wired, Nature and MIT Technology Review, among others. His latest book is Utopia Is Creepy (2016). In 2008, Samuel O Poore, a plastic surgeon who teaches at the University of Wisconsin’s medical school, published an article in the Journal of Hand Surgery titled ‘The Morphological Basis of the Arm-to-Wing Transition’. Drawing on evolutionary and anatomical evidence, he laid out a workable method for using the techniques of modern reconstructive surgery, including bone fusing and skin and muscle grafting, to ‘fabricate human wings from human arms’. Although the wings, in the doctor’s estimation, would not be capable of generating the lift needed to get a person off the ground, they might nonetheless serve ‘as cosmetic features simulating, for example, the nonfunctional wings of flightless birds’. We have always envied birds their wings. From angels to superheroes, avian-human hybrids have been fixtures of myth, legend and art. In the 9th century, the celebrated Andalusian inventor Abbas ibn Firnas fashioned a pair of wings out of wood and silk, attached them to his back, covered the rest of his body in feathers, and jumped from a promontory. He avoided the fate of his forebear Icarus, but a witness reported that ‘in alighting… his back was very much hurt’. Leonardo da Vinci sketched scores of plans for winged, human-powered flying machines called ornithopters. Batman’s pinion-pointed cape looms over popular culture. Birdman won the best picture Oscar in 2015. ‘Red Bull gives you wings,’ promise the energy drink’s ads. Not everyone shared his caution. Advocates of radical human enhancement, or transhumanism, found inspiration in the article. One of them, writing on a popular transhumanist blog, suggested that it might soon be possible to craft working human wings by combining surgical techniques with synthetic muscles and genetic modifications. ‘Many humans have wished they could fly,’ the blogger wrote. ‘There’s nothing morally wrong with granting that wish.’ The post garnered more than 700 comments. ‘I WANT WINGS!!!!!!!!!!!!! !’ went a typical one. ‘For as long as I can remember I have been longing to feel the wind in my feathers,’ went another. If to be transhuman is to use technology to change one’s body from its natural state, then we are all already transhuman. But the ability of human beings to alter and augment themselves might expand enormously in the decades ahead, thanks to a convergence of scientific and technical advances in such areas as robotics, bioelectronics, genetic engineering and pharmacology. Progress in the field broadly known as biotechnology promises to make us stronger, smarter and fitter, with sharper senses and more capable minds and bodies. And scientists can already use the much discussed gene-editing tool CRISPR, derived from bacterial immune systems, to rewrite genetic code with far greater speed and precision, and at far lower cost, than was possible before. In simple terms, CRISPR pinpoints a target sequence of DNA on a gene, uses a bacterial enzyme to snip out the sequence, and then splices a new sequence in its place. The inserted genetic material doesn’t have to come from the same species. Scientists can mix and match bits of DNA from different species, creating real-life chimeras. The ultimate benefit of transhumanism, argues Nick Bostrom, professor of philosophy at the University of Oxford, and one of the foremost proponents of radical human enhancement, is that it expands ‘human potential’, giving individuals greater freedom ‘to shape themselves and their lives according to their informed wishes’. Transhumanism unchains us from our nature. Critics take a darker view, suggesting that biological and genetic tinkering is more likely to demean or even destroy the human race than elevate it. The ethical debate is profound, but it seems fated to be a sideshow. The public is not going to approach transhumanism as a grand moral question but rather as a set of products and services, each offering its own possibilities for self-expression and self-definition. Whatever people sense is missing in themselves or their lives – the power of winged flight, perhaps – they will seek to acquire with whatever means possible. We are myth-makers as well as tool-makers, and biotechnology promises to return us to a more mythical existence, as we deploy our new tools in an effort to bring our dream selves more fully into the world. ‘I want to fly!’ cries Icarus in the labyrinth. ‘And so you shall,’ says Daedalus, his father, the inventor. It’s an old story, but we’re still in it, playing our parts. Just before twilight on a cool Saturday evening in spring 2015, the rock climber Dean Potter hiked with his girlfriend Jen Rapp and his buddy Graham Hunt from a parking area along Glacier Point Road to the edge of Taft Point, some 3,000 ft above the Merced River in Yosemite Valley. Potter and Hunt were planning a ‘BASE’ jump, an acronym for jumping off a building, antenna, span or Earth. They would leap from a ledge near the point and glide in their wingsuits for a quarter mile over the valley before passing through a notch in a ridgeline near a rock outcropping called Lost Brother. They would then unfurl their parachutes and come in for a landing in a clearing on the valley floor. Rapp would take photographs. BASE jumping, one of the more extreme of extreme sports, is banned in national parks. But Hunt and Potter were dedicated daredevils who didn’t put much stock in rules. They had been jumping for years from cliffs and peaks throughout Yosemite, including the iconic Half Dome, and they had wingsuited from Taft Point several times, together and separately. The course they set for themselves that evening was dangerous – the notch was narrow, the winds contrary – but they were confident in their skills and their equipment. 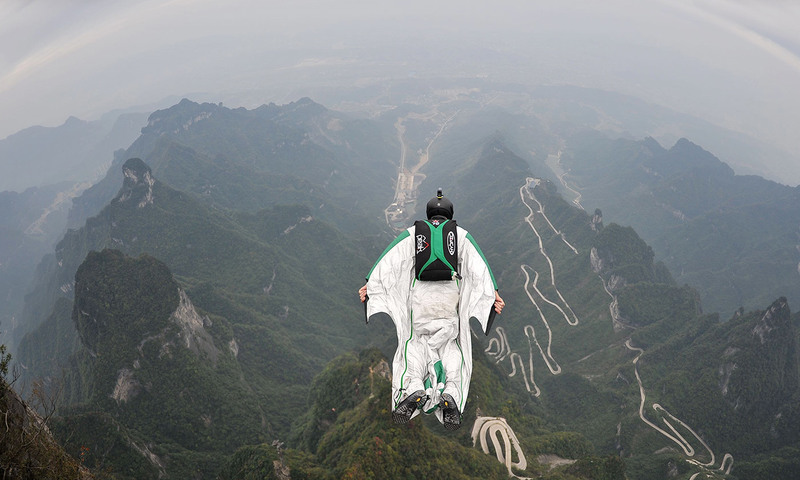 Potter held the mark for the longest wingsuit flight on record, having covered nearly five miles in a 2011 jump from the Eiger in Switzerland, and he had been featured in a National Geographic documentary called The Man Who Can Fly. Hunt, too, was considered one of the world’s top jumpers. The first wingsuiter, if you don’t count Abbas ibn Firnas, was Franz Reichelt. A Vienna-born tailor who ran a dressmaking shop in Paris, he designed and stitched his own ‘parachute suit’, as he called the winged garment. He tested it by jumping off the Eiffel Tower on 4 February 1912. The suit failed, and the fall killed him. More than 80 years passed before a Finnish company called BirdMan International began manufacturing reliable wingsuits and selling them to skydivers and BASE jumpers. Constructed of lightweight, densely woven nylon, modern wingsuits sheath the jumper’s entire body, forming two wings between the arms and torso and another between the legs. By greatly expanding the surface area of the human frame, the suits create enough lift to allow a person to glide downward for several minutes while controlling trajectory through slight movements of the shoulders, hips and knees. Wingsuiters frequently reach speeds of 100 miles per hour or more, giving them an exhilarating sense that they’re actually flying. Rapp kept taking photographs until Potter and Hunt passed through the notch and out of sight. She thought she heard something, a couple of thumps, but she told herself it was probably just the chutes opening. She waited for the text message that would let her know the pair had landed safely. Nothing came. Her phone was silent. Park rangers recovered the bodies the next morning. Reprinted from ‘Utopia is Creepy: And Other Provocations’ by Nicholas Carr. Copyright © 2016 by Nicholas Carr. With permission of the publisher, W W Norton & Company, Inc. All rights reserved.